At the beginning of his turn, The Emperor of Jin chooses one of the elements. Wind - All fire damage dealt to all characters is increased by one. Thunder - All lightning damage dealt to all characters is increased by one. Water - Whenever a character is healed with a peach, they heal an additional health. Fire - All damage dealt is considered to be fire damage. Earth - All elemental damage is reduced to 1. The Emperor of Jin can only have one element active at a time. 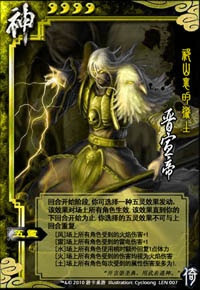 At the beginning of his turn, he must change the active element. At the beginning of the game, the Emperor of Jin does not have an element. At the beginning of his first turn he chooses one. If the Emperor of Jin dies, all the effects of the elements stop.